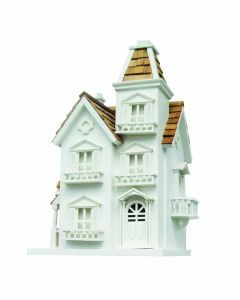 The light blue cottages that dot a New England summer resort destination are the inspiration for this sweet little birdhouse. The two front windows feature flower box details, and a half moon opera window sits above the door. 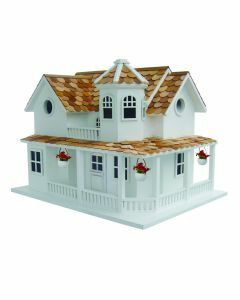 The Nantucket Cottage birdhouse is constructed of exterior grade ply-board with poly-resin details. 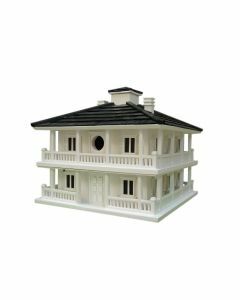 This style is a fully functional birdhouse with removable back walls, drainage, ventilation, mounting bracket and a 1.25″ entry hole. The convenient, swing-up paddle-board attached to the back makes hanging this beautiful birdhouse as easy as a walk along the island shore. Item Dimensions: 8.75″ H X 6.25″ W X 7.75″ D. Click on image for greater detail.